College Hockey News writer Mike McMahon and other voices in the hockey community are suggesting that Harvard Associate Head Coach Paul Pearl will join Albie O’Connell’s staff in the same position. Told that Paul Pearl is the front runner for the open BU assistant job that opened up when Albie O’Connell was promoted to head coach. Pearl is on Ted Donato’s staff at Harvard. Was previously a longtime head coach at Holy Cross. In 2014, Pearl left Holy Cross after 19 years as head coach to become a member of Crimson Coach Ted Donato’s staff, replacing O’Connell who had moved across the Charles River to join David Quinn’s staff at BU. If Pearl does become a Terrier assistant, he’ll be reunited with goalie coach Brian Ecklund who spent three seasons mentoring Harvard goalies before joining the Terrier staff. Three current Terriers and two incoming freshmen were named to USA Hockey’s 42-man roster for the 2018 World Junior Summer Showcase (July 28-Aug 4) in Kamloops, British Columbia. The five players are rising sophomores Brady Tkachuk, Logan Cockerill (photo) and David Farrance and recruits Joel Farabee and Jake Wise. The WJSS event is the initial step in choosing the U.S. Junior National Team, which will compete in the 2019 World Junior Championships, also set for British Columbia. Dobber Prospects final rankings for the 2018 draft has three Terriers in the top 19: Tkachuk #9, Farabee #10, Wise #19. Reporter Jeff Cox discussed Farabee with NTDP U18 Coach Seth Appert in advance of next week’s NHL Entry Draft in Dallas. USA Hockey profiles 2019 recruit Case McCarthy. The right-shot defenseman from Clarence, NY scored 18 points in 41 games for the NTDP U17s in an injury-shortened season. Two-time All-American and Terrier captain Matt Grzelcyk has re-upped with the Bruins, signing a two-year deal with an annual cap hit of $1,400,000. The Charlestown, Massachusetts native began last season with AHL Providence but was called up and took a regular spot on Boston’s blueline, putting up 15 points in 61 regular-season games and playing in 11 playoff games. Brandon Hickey, captain of the 2017-18 Terriers had his draft rights traded to the Buffalo Sabres by Arizona. 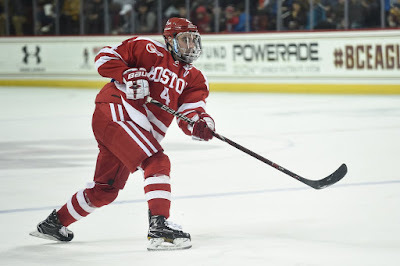 If he signs with Buffalo, he’ll be reunited with former Terrier teammates Jack Eichel, Evan Rodrigues and Danny O’Regan in the Sabres’ organization, as well as assistant general manager Steve Greeley, a BU associate head coach during Hickey’s freshman season. Hickey, who scored 64 points as a four-year starter on BU's blueline, was originally drafted in 2014 by Calgary, who traded his rights to the Coyotes in 2017.